Are you tired of passwords? You’re not alone. So many of us are overburdened with passwords that we end up compromising security for the sake of sanity. We take shortcuts — we reuse the same passwords for more than one web app or we choose really simple passwords that are easy to remember. But both of these tendencies open us up to hacking. Of course, we recommend using a single sign-on service like our Intermedia AppID® to help make logins much easier. One password to remember and an easy-to-use portal to access all of your web apps. Plus, when you add an extra layer of security that two-factor authentication (2FA) provides, you get a solution that offers additional security while still being easy for everyone to use and manage. But what about the future? Will we always be dealing with passwords? Maybe not…. 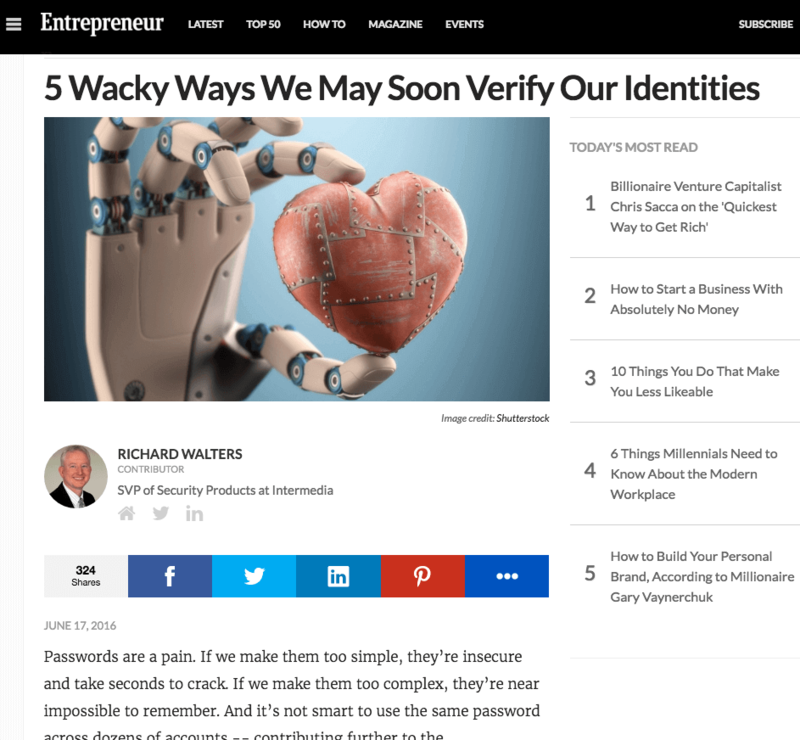 Richard Walters, our SVP of Security Products, wrote an article recently for Entrepreneur that reviews some innovative and frankly, “wacky” ways that we might be using to verify our identity in the future. These ideas focus on the use of biometrics — the physical and behavioral characteristics that are unique to each person. I won’t spoil the surprise by telling them to you here. You’ll just have to read the full article. But once you do, I think you’ll agree that the future could possibly be password-free. In the meantime, if you are tired of dealing with all those passwords, please call us at 800-379-7729 for more information about Intermedia AppID, our single sign-on service that comes free with all our Office in the Cloud™ plans.